One of the most influential saxophone players in the history of jazz, Johnny Hodges played lead alto in Ellington’s sax section. His melody lines were an important component in the band’s palette of sounds. He was featured on countless Ellington recordings, demonstrating his skill at ballads and up-tempo numbers. 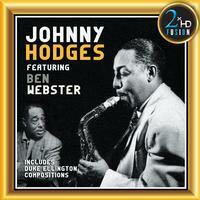 Hodges was so closely associated with Ellington that jazz fans were taken by surprise when he left the band in 1951 to form his own combo. In this album recorded in the early ‘60s, he teams up with tenor sax player and ballads master Ben Webster to perform some of his compositions made famous during his Ellington years. The process uses a selection from a pool of high-end audiophile components and connectors. In some cases even using battery power, so as to benefit from the cleanest power source possible. This variable equipment combination custom tailored to each project, creates the most accurate reproduction of the original recording, unveiling information previously masked by the use of EQ, transformers, patch bays, extended cable length etc. The selection of components is critical, as many A/D and D/A converters are unable to pierce through these filters that create a ceiling effect to the sound. The 2xHD system preserves the dynamics of the original master and provides an open feeling to the sound.